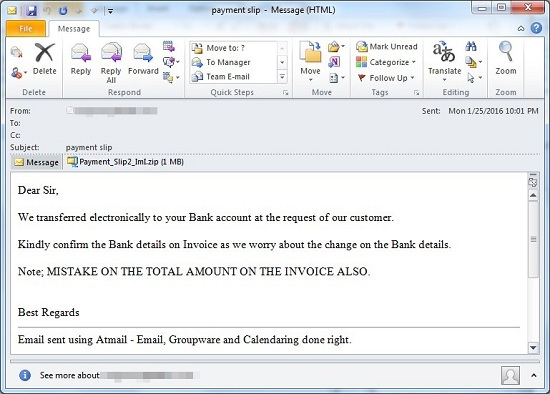 According to a report published by the security firm TrendMicro, Business Email Compromise (BEC) attacks could reach $ 9 billion in 2018. According to a report published by TrendMicro, Business Email Compromise (BEC) attacks had surpassed the value of damage to enterprises in the past years and it is estimated that it could reach $ 9 billion dollars in 2018. This rising value of loss for business takes into account new attack vectors like the one from Lebanese Intelligence Agency Dark Caracal malware who utilizes malware in android application. The report lists how BEC attacks are usually conducted. The techniques are: Bogus invoice scheme, CEO fraud, Account compromise, Attorney impersonation and Data Theft. The report highlight that these attacks can be classified into two major groups: Credential grabbing and email only. The credential grabbing technique as detailed by the report has shown an increase in phishing HTML pages that are sent as spam attachments. Also, by employing malware campaign hackers target organizations. One recent example of malware is Zyklon that exploits flaws in Microsoft Office. The charts in the report shown that the attacks have doubled in the period from January to September 2017. As discovered by researchers in the report, the two main types of malware techniques employed are keyloggers and Remote Access Tools (RAT). Since these tools are low cost and effective they can harvest all credentials on any infected machines. Malware techniques are very hard to detect by anti-virus since they are widely shared in forums or placed in applications commonly used on a daily basis. The report lists the most common malware used in Business Email Compromise attacks: AgentTesla, CyborgLogger, DarkComet, DiamondFox, Dracula Logger, iSpy Keylooger, Knight Logger and Luminosity Link. The report also suggests how to defend and avoid against BEC attacks: Employee awareness and education, verifying emails received, verification of the legitimacy of executive requests, verification of requests from vendors and suppliers, verification of any requests and the adoption of a security culture within the organization. Luis Nakamoto is a Computer Science student of Cryptology and a enthusiastic of information security having participated in groups like Comissão Especial de Direito Digital e Compliance (OAB/SP) and CCBS (Consciência Cibernética Brasil) as a researcher in new technologies related to ethical hacking, forensics and reverse engineering. Also a prolific and compulsive writer participating as a Redactor to Portal Tic from Sebrae Nacional.